At Affordable Gutters Plus, we bring expert-level seamless rain gutters to Canton and Roswell, GA and all surrounding areas. Our attention to detail and superior materials elevate us to the top of the ladder for seamless rain gutter installation. This remarkable gutter alternative, when installed correctly, makes gutter worries and issues a moot point for the life of your home. If you want a long-term, sustainable, and affordable answer for your home’s gutter system, seamless rain gutters should arrive like a saving grace. 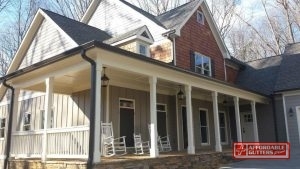 Call Affordable Gutters Plus today at 770-735-4433 to learn more or schedule an installation. Just as the name implies, seamless rain gutters have no breaks over the length of the gutter. The only seams occur at interior and exterior corners. A lack of breaks in the long lines of the gutter protects against leaks and ensures a long-lasting, dependable product. No seams means zero leaks, which has made seamless rain gutters, by far, the most popular choice among rain gutter installation services. Typically made from aluminum, seamless rain gutters get constructed on-site. At Affordable Gutters Plus, we bring our rain gutter fabrication machine directly to your home or business. The customizable nature of seamless rain gutters means they work perfectly with the design of your structure. Regardless of the number of gutters you need, Affordable Gutters Plus creates long-lasting, dependable products. These seamless rain gutters, custom built for you, flow seamlessly along the lines of your building. As aesthetic components, seamless rain gutters have a much higher appeal than traditional alternatives. 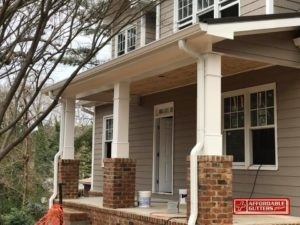 If you would like seamless rain gutter systems in Canton and Roswell, GA for your home or business, contact Affordable Gutters Plus at 770-735-4433. With a traditional, old-fashioned gutter system, the pieces of the gutter get connected across its length. These sectional gutters get built along snap-in-place connectors, which weaken over time. The drawback occurs at these connections, which provide an avenue for water leakage. As water leaks from the seams, it rots the wood behind the gutter. Instead of a feature that protects your structure from water damage, the gutter suddenly becomes its own source for rot and leakage. Seamless rain gutters have many advantages over traditional gutters with snap-in-place connectors. Lessened probability of leaks: With fewer seams to weaken over time, seamless rain gutters provide long-lasting, dependable protection for your home. A lack of weak points in the gutters’ construction means you can trust in the dependability of your investment. No more unsightly seams: Snap-in-place connectors and seams lessen the attractiveness of gutters. For such a major component of your structure’s exterior, gutters should add to, not detract from, its visual appeal. Durability: Seamless rain gutters last much longer than traditional alternatives. The finishes on seamless gutters also resist fading and chipping. Once you have seamless rain gutters from Affordable Gutters Plus installed on your home, you no longer have to worry about future gutter issues. Fit Exact Measurements: Formulated directly on the job site, seamless rain gutters fit the precise measurements of your home. A home or business should appear as the custom expression of its occupants. Seamless rain gutters provide another customizable element to make your structure your own. Quick Installation: With no time-consuming connector process, seamless rain gutters can often get installed in a single day. Every element of building construction and maintenance costs time and money — with seamless rain gutters, you can count on one component that installs quickly and affordably. Protects Your Home: Gutters exist to protect a home or business from the damaging effects of rainfall. All too often, however, the gutters can become a source of damage themselves. As leaks form in traditional gutters, water runs from the seams onto the structure itself. This results in rot and other damage, and leaves unattractive stains. Many colors: These types of gutters are fully customizable to the look and color of your structure. Crafted on-site, to the specifications and appearance of your home, seamless rain gutters provide a crowning ornamental touch. With High-Quality Materials And Installation, Your Home Gets The Defense It Deserves. When to Install Seamless Rain Gutters? Immediately! Old-fashioned, traditional gutters have a large scale negative impact on the overall health of your structure. A simple visual inspection of the exterior of your home can reveal whether you need new gutters today. Remember, gutters exist to protect the exterior of your home from water damage. Water runs off the roof, into the gutters, and away from your home. If you see any signs of water damage on the home, then your gutters have failed and need repair. Obvious signs of water damage include mold and peeling paint. Typically, these instances will occur near the seams of snap-in-place connector gutters. Affordable Gutters Plus will arrive at your home or business with a seamless gutter machine. The machine produces these gutters to the specifications of your structure. Afterward, the gutters get cut to measure, then installed on the structure. 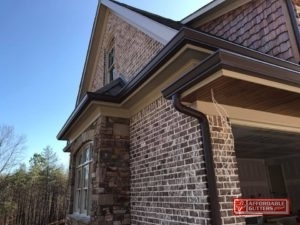 As with all of our products, seamless rain gutters in Canton and Roswell, GA benefit from the expert-level installation of the Affordable Gutters Plus team. We take measurements to ensure the proper pitch of your new seamless gutters. Water runoff has never occurred so naturally — or seamlessly — as it will after our installation process. At Affordable Gutters Plus, our reputation for honesty and affordability precedes itself. If you struggle with problems from your gutters, do not hesitate: call us today. The weather in North Georgia demands a properly functioning gutter system to protect your home and investment. At Affordable Gutters Plus, we work with the best materials to bring you state-of-the-art, customizable seamless rain gutters. Whether you’ve got a new piece of construction, or need old gutters replaced, trust our team to do the job right. For all of your seamless rain gutter needs in Canton and Roswell, GA and surrounding areas, call Affordable Gutters Plus today at 770-735-4433. Updated on September 20, 2018 at 6:48 pm by Affordable Gutters Plus LLC.